King's Cross is a new church in eastern Loudoun County, Virginia. We are being planted by McLean Presbyterian Church (PCA), as a part of their decades-long mission to transform the DC metro area with the Gospel of Jesus. Our church planter and pastor, Paul May, moved with his wife Meaghan and their kids (Austen, Claire, Evan, Lydia, and Nathan) to eastern Loudoun County in 2015. They are glad to call it home! They have experienced the transforming love of Jesus and would love to talk with you about it. Paul attended Reformed Theological Seminary in Orlando, where he earned a Master of Divinity and an MA in Counseling. 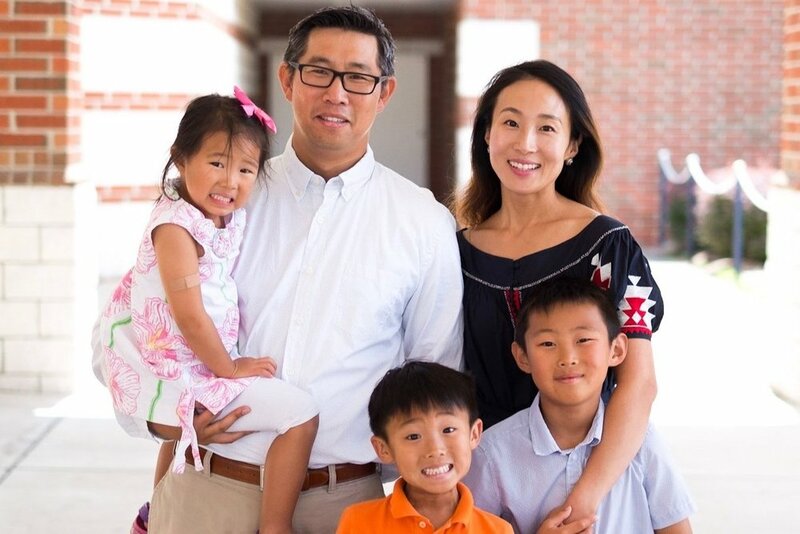 He loves National Parks, chocolate peanut butter cupcakes, playing with his kids and his guitar, and is excited to see God's story for King's Cross and Loudoun County unfold. As our director of worship, Emily coordinates each step of the Sunday morning worship process - from choosing songs to organizing musicians to singing lead vocals, Emily does it all! Emily brings her sense of humor and New Yorker straight talk to both King's Cross and McLean Presbyterian Church (where she is the assistant director of communications). When she is not working, Emily enjoys spending time with her husband Hart and their kids Theo and Naomi. Silas helps out at King's Cross in whatever way he can, helping with the facilities team, assisting in leading the Sunday service, preaching occasionally, and serving in many other ways. He is an ordained minister, and currently works full-time at a local business. He and his wife Young have 3 energetic children: Miles, Moses and Ariana. During his time away from work, he enjoys spending time with his family, meeting and spending time with people and drinking some good coffee. We are blessed to have him at King’s Cross! We’re excited to have Maggie on board as our children’s ministry intern! She works alongside and serves our amazing volunteers toward the goal of seeing kids’ hearts changed and shaped by the love of God. Maggie grew up in northern Virginia, and is passionate about providing a safe, caring, grace-enriched, and formative environment for kids at King’s Cross. In her free time she loves making art and any chance to enjoy the beauty of God’s creation from a hiking trail! Emily keeps all the logistical details of King's Cross running smoothly in her role as administrative assistant. Whether it's sending e-mails, ordering supplies, or helping to plan events, she wears a lot of hats around here! When she's not working, Emily enjoys playing piano, freelance gardening, road trips and movie nights with her sisters! Our team would love to serve you in any way we can. The core of our care, however, thrives in our relationships with one another. We all need people who get us, friends that enjoy pouring into one another. A place where we grow in trust and friendship, in being loved and in learning to love. Our Gospel:Life groups are a great place for that.